Home Dogs for Adoption Donations What is a Wolfdog? Lake Tahoe Wolf Rescue is active legislatively this session and testifies in support of animal rights bills. We work with lobbiests for the animals, and hope you will sign petitions that will help their cause. It is the mission and goal of Lake Tahoe Wolf Rescue to save Wolves, Wolfdogs - and dogs that resemble wolves - from abuse, abandonment, neglect and euthanasia; to rehabilitate them both physically and emotionally using a holistic approach; and to find qualified foster homes for them until adoption or until a suitable sanctuary is found. LTWR endeavors to educate the public about the right and wrong reasons to own a Wolfdog, and to eventually put an end to the irresponsible breeding and buying of Wolves and Wolfdogs. 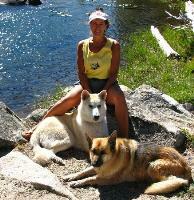 Lake Tahoe Wolf Rescue is a not-for-profit all-volunteer organization. Lake Tahoe Wolf Rescue is not a sanctuary and we do not "take in" dogs on our property. We endeavor to help find qualified Foster Homes until the dog can be placed in a permanent and qualified situation. We have a very successful adoption rate and although it takes a little longer because we are ever so picky, over 95% of the dogs posted on our website find good homes. We do not discriminate by helping only easy-to-place dogs. In fact, most of the dogs posted require a great deal of time and energy to find appropriate adopters who can care for them properly. Our objective is to work cohesively with shelters, current owners, and qualified adopters. We network nationwide with many other Rescue groups, Sanctuaries, and not-for-profit organizations. We do interviews, reference checks and Home Visits for all applicants in order to find suitable homes for these special-needs animals. We have found that it is usually the lack of education about the behavior of Wolfdogs that causes the owners of these animals to give up on their animals. All puppies are cute and cuddly and these babies are most endearing but knowing about the breed can prevent heartache and needless suffering for the animal. Most people with good intent try to raise Wolfdogs from pups only to later realize that they are not dealing with a typical dog. Many breeders do not properly qualify their buyers and don't care if the dog is later passed around or winds up at a shelter. Their aim is to make money, so often they will not inform buyers of the specific behaviors to be expected. Wolfdogs have special needs that most people don't understand or are not willing to take the time and effort to work with. For example, feeding an inadequate diet [of inexpensive commercial dry food usually bought in grocery stores] can often have disastrous results over long term, causing poor digestion, various diseases, or irritability that leads to unwanted behaviors. Leaving a Wolfdog in a back yard or tethered on a cable often results in the Wolfdog becoming aggressive, fearful, or unsociable. Please enjoy our site, and while you navigate, keep in mind that we have stringent requirements for all of our potential adopters [see Adoption Requirements page]. We certainly do not want these animals which are already stressed to go to an environment where they will not get the daily care and attention they need. Visiting the Rescue Gallery and Rescue Stories will give you a good idea of why we are so passionate about getting these animals into the right homes where they will be well cared for - for the remainder of their lives. We always try to adopt our rescues into homes that will continue a holistic regime of a high-quality real-meat diet, behavior training, and lots of daily exercise. They all need escape-proof containment. Animals available for adoption are posted on our Dogs for Adoption page. If you think you have the appropriate experience, environment and lifestyle to give one of these special animals a home, please contact the Person of Contact [POC] found at the bottom of each Bio. As part of the process the POC will carefully review your Adoption Application to ensure a good match. Someone will then call for a phone interview and set up a Home Visit to verify that you truly have what it takes to give a Wolfdog a happy and secure home. Qualified Foster Homes are also badly needed to give a rescue temporary sanctuary until an appropriate adopter can be found. To find out more about what we do, please visit our About Us page. Donations are also greatly appreciated and help us to continue our rescue efforts to save even more animals. When you donate, 100% of your contribution goes toward the rescues for food, transportation, spay/neutering, supplies, medical treatment, etc. Hope you enjoy our website. There is a lot of information for you to browse through - articles on feeding and safety tips; links; and of course photos and bios on our dogs for adoption. Enjoy your visit and please help out with a donation. If everyone pitches in, so many more wolfdogs will be pulled from shelters, and Lake Tahoe Wolf Rescue will be able to continue to save lives. Thank you! you receive $25 off the purchase price . Offer good until Dec. 21st. Use the code JINGLE25 when checking out. Lake Tahoe Wolf Rescue also gets a nice little donation. Browse through for special deals and big savings! I bought one for my dog and I LOVE it. I always know where he is. Check it out! Wish I had one for my husband! Rescue Organizations - Link us To Your Website! Home Contact Us Dogs for Adoption Donations Natural Remedies What is a Wolfdog? Lake Tahoe Wolf Rescue Even a Little Bit Helps! © Copyright by Lake Tahoe Wolf Rescue, 2008. All Rights Reserved.